Mr. McFall serves as the Chief Scientist on both legs of research here in Gray's Reef National Marine Sanctuary this summer. 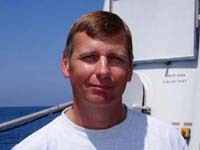 Greg offers a lifetime of extensive diving experience, as well as wealth of knowledge about marine ecology. He is no stranger to the sanctuary since he functions as the Research Coordinator for GRNMS, and has done so for the past three years. Greg's passion for diving is obvious to anyone who is in his company for long. He recalls his first diving experience in a lake, at the age of 13, when he and a friend borrowed some diving gear and dove down to the lake's bottom to get a view of a sunken Volkswagen. Little did Greg know at the time, but this was a first of more than 4,000 dives he would make in his life. Believe it or not, this diving fanatic did not grow up around the ocean, like most other scientists working on this ship. In fact, Mr. McFall only visited the coast once before the age of 18. Instead, he attributes his experience in the United States Navy as sparking his interest in the oceans. Greg spent five years as a US sailor and had the opportunity to visit 19 countries during his service. During his service, he had the opportunity to learn more about scuba diving when he joined the Naval Dive School. This rigorous program was one of the hardest things that he had ever done; it tested Mr. McFall both mentally and physically. Greg's diving experience in the Navy opened many doors for him. After graduating from the dive school, he soon joined the Navy Underwater Photo Team. Here, he worked as one of eight underwater cinematographers along the east coast for the research and development needs of the military. After leaving the military, Mr. McFall tried several different career options like starting college and diving for commercial projects, but nothing seemed as a good fit until he saw an add for a position in the Bahamas with the Atlantic Undersea Test and Evaluation Center. Here, he worked as a contractor with the US Naval Warfare Testing group for a few years. Finally, his life experience paved the way and provided the motivation to return to West Virginia University to pursue his bachelors degree in Biology, with a minor in Chemistry. Here, he made the Dean's List and graduated near the top of his class. After he graduated, he went straight into the Masters of Marine Biology program at the University of North Carolina - Wilmington. Mr. McFall is one of the few to have the best of both worlds; he has the opportunity to travel, dive, conduct research, write papers, and participate in many different kinds of research. "Everything I've done up to this point in my life has been practice for this job," Greg proclaims. Those who have had the opportunity to meet Greg know that he has definitely found his niche. In fact, his connection to the sanctuary is so strong that his son was disappointed when to learn that this father works in Gray's Reef, not "Greg's Reef". * Learn science and math well. Without a solid foundation in these disciplines, you will have a difficult time. * If you are not ready for college, join the Navy. There are many different ways to get experience that you can apply to your career goals. * Be persistent and don't give up. It may take time to find your dream job. * Volunteer or do anything to get your face and name out there. The marine science field is still small enough that word-of-mouth is a good way to get recognized. Dr. Kracker works for the National Oceanic and Atmospheric Administration in Charleston, S.C. as a geographer. She earned her Ph.D. in Geography from the University of Buffalo and she also possesses a masters degree in Math and Natural Science, as well as a bachelors degree in Fine Arts. 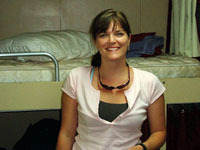 Laura's role on the ship is two-fold; she is helping to organize the data, as well as work with other scientists with the acoustic instrumentation. Her background in Geographical Information System (GIS) technology, is well-suited for this research operation. We have many different instruments being deployed and each has their own set of operating procedures. Keeping all of the data organized would be a problem for most people, but not for Laura. She has systematically identified each of the sample sites and instruments being used. This will help minimize confusion once we return to land and help to differentiate among the different samples collected during our trip. and has begun to spatially organize the data in a map form. Laura uses GIS software called ArcView to spatially arrange data so that we can make inferences about relationships, patterns of change, and calculate distances between features. If you have never seen a GIS map before, think of a typical road map. It may include major highways, roads, subway or train tracks, parks, restaurants, even gas stations. Let's imagine that you are only concerned about the parks in the area that are close to a gas station, so you may choose to view only the parks and gas stations on your map. The same is true with Laura's map. With this software, we can choose the different characteristics of Gray's Reef that we want a map to show. Let's take black sea bass, like the ones found today. If we so choose, the software will allow us to view only the stations where these fish were found in high abundances. Other kinds of data like latitude, longitude, bottom habitats, time of day, and water depth are also included. We will be able to compare these characteristics to the data that we collect at each station. This technology will help scientists base inferences about the kinds of habitats and environmental conditions that these (and other) fish prefer. Laura mentioned that data collected on this survey of Gray's Reef gives scientists an advantage because each of these stations are sampled using a variety of instruments and methodologies, providing an integrated view of the sanctuary. In addition, the maps are tools for laying out a foundation for scientific inquiry and will assist each scientist, once back on land, to organize and analyze their data. Dr. Kracker is also interested in collecting acoustic data while aboard the Nancy Foster. She will be working with Dr. Daniela Di Iorio's using a single beam sonar instrument. The transducer, which emits, receives, and records the sound, provides evidence of the location of the fish in the water column, as well as fish size. This instrument will be discussed in greater detail as the week progresses. Be sure to check back with us everyday to see what we new discoveries we have made. Dr. Gilmore is part of our research staff on Leg 1 to Gray's Reef. He is a fish ecologist and he brings extensive marine biology knowledge and skills to our team. Grant currently serves as President and Senior Scientist of Estuarine, Coastal and Ocean Science, Inc. (ECOS) and has enjoyed an exciting and fulfilling career in marine biology. He has served as a professional ichthyologist (scientist who study fish) and fish ecologist since 1971. Grant has worked with many agencies and institutions such as NASA and Harbor Branch Oceanographic Institution where he had the opportunity to dive more than 300 times in submersibles for ichthyological research purposes. Additionally, Dr. Gilmore has either participated in or organized 12 nationally and internationally televised documentaries of marine research, as shown on the Discovery Channel, National Geographic, Audubon, FOX, and New Zealand TV. Grant's interest in marine biology began when he was just a baby. At 15 months of age, while on a boat with his family in the Pacific Ocean, he became so intrigued by the sharks near the boat that he leaned over a little too far and almost slipped in. Grant believes that his fascination with marine animals at such a young age must have been a sure sign that he would some day choose marine biology as a career. His childhood experiences with the ocean and marine mammals did not stop there. As a boy, he recalls always growing up by the water. Whether he was on a boat in the Pacific, the coast of Florida, the banks of the Yellow Sea, his upbringing near the water definitely affected his drive to learn more about it. By the time Grant entered his undergraduate program at the University of West Florida, his passion to learn more about the ocean was temporarily misdirected. He almost made it to graduation to become an aeronautical engineer, that is, until he took a biology class his junior semester. His teacher greatly inspired him and motivated him to change his program of study to biology, and so he did. He immediately fell in love with the opportunities to connect with animals and the ocean. Later, he pursued a masters in Biological Sciences from the University of West Florida and doctorate degree in Biological Sciences from Florida Institute of Technology. While he loves being a marine biologist and conducting research, he is also responsible for seeking out funding to make experiences like this one to Gray's Reef possible. Dr. Gilmore spends at least 85% of his time writing grant proposals and stresses the importance of writing well. He wishes that more of his time could be devoted to research, whereby he could focus his energy and creativity in designing new methods and technical equipment. 1. Don't let available funding and the needs of our society solely drive the kinds of research that you do. The very nature of science involves creativity and imagination. 2. Take time to learn more about the work of scientists of other disciplines. 3. Before devoting your life to marine biology, get out on a boat and experience it first hand. 4. Eat the fish you catch. understand your work and support it. Grant brought three PAMS instruments (picture on right) aboard the Nancy Foster for the purposes of recording ambient fish and human sounds in the sanctuary. To learn more about this instrument, visit Tuesday's log. Dr. Sedberry is the Co-Chief Scientist for this mission in Gray’s Reef National Marine Sanctuary. He also serves as Senior Marine Scientist and Assistant Director of the Marine Resources Institute for the South Carolina Department of Natural Resources (SCDNR). He earned his Ph.D., as well as his Masters of Arts in Marine Science from William and Mary’s Virginia Institute of Marine Science. He also graduated from Old Dominion with a Bachelors of Science in Biology. It is obvious to anyone that meets George, his profession is a perfect match with his love of the ocean and fisheries. "I’ve been interested in biology for as long I remember," said Dr. Sedberry. Living on the James River as a child motivated George to learn as much as possible about natural science. His uncle, a biology teacher and his mentor, often took George fishing and hiking. During these times together, George’s curiosity and love for science blossomed. When Dr. Sedberry was a kid, you would not have found him sitting in front of a television set. Instead, it would have been common to find him in the library with his sister reading The Sea Around Us or Half Mile Down. Books like these called to Dr. Sedberry and inspired him to explore the oceans and their fisheries. Dr. Sedberry is a strong proponent of education and actively seeks out opportunities to share his experiences with local schools, sport fishing clubs, diving clubs, and senior citizens. He feels it is important that others understand the purpose of fisheries research so they will respect marine ecosystems and help support their management. His book "Island in the Stream" is just one example of his efforts to communicate with the general public. In the future, George intends on completing a book based on the marine fishes of Belize. He also plans to write a book focusing on the marine fish of South Carolina. · Work hard to acquire the basic scientific knowledge and skills related to your field of interest. · Read books, journals, newsletters, and find other sources of information to increase your understanding about current and historical research. · Become a volunteer, intern, or find a mentor so that you can learn about marine science through a hands-on approach. · Find more opportunities to participate in outdoor activities that you enjoy, such as fishing and snorkeling. · Challenge yourself by taking activities you enjoy to higher levels. · Read about the biology of the fish you catch or identify the plants you see on a hike. · Make connections with individuals in the academic field/s that you wish to pursue. Introduce yourself by emailing, calling, and visiting them. Don’t be afraid to ask them if there are any future opportunities or openings that you may apply for. You never know, if you don’t ask. Athan is a graduate student at the College of Charleston pursuing a master’s degree in Environmental Studies with focus in marine science. His academic background is rooted in Biological Science and he possesses a bachelor’s degree from Colgate University. For Leg 1 of this exploration, he joins Dr. George Sedberry and fellow scientist, Marion Beal, to assist with the collection of information on the fisheries in Gray’s Reef. Mr. Barkoukis became interested in the oceans at an early age. It all started with family vacations and annual fishing trips to the Outer Banks, North Carolina. These activities inspired him to pursue his dream of working in the marine science field some day. Since that time Athan has sought out several experiences to enhance his understanding of marine science. He became a certified scuba diver, as well as worked in Antarctica where he used biological assessments to reconstruct the history of the Larsen Ice Shelf. Before enrolling at the College of Charleston, he also worked as an intern at Mote Marine Laboratory constructing artificial reefs in Gulf of Mexico for red snapper stock enhancement. Obviously, Athan brings a wealth of knowledge and experience to our team of scientists aboard the Nancy Foster. When Athan is not in a classroom or on conducting research on ships, he works with Dr. Sedberry in developing his master’s thesis. He hopes that his graduate efforts, coupled with experience like this to Gray’s Reef, will provide him with a holistic understanding of marine science by blending research and policy. Athan looks forward to finding the perfect career that will synthesize his interests in marine science and by the look on his face this week; he is well on his way to finding his niche. · Ask as many questions as you can. · Do not be blinded by a one-direction approach, in research interests because you may pass up many other great opportunities along the way. Marion, a genetics biologist, is part of the crew joining the Gray’s Reef expedition from the South Carolina Department of Natural Resources (SCDNR). She received her Bachelors of Science degree in Biology from Appalachian State University in Boone, North Carolina. While she loves working in the lab, Marion thoroughly welcomes additional opportunities, like this one in Gray’s Reef, to conduct research with other scientists, especially on boats. She feels that her work with genetic data is only one piece of a multi-faceted system that scientists can use to reveal a more holistic view of marine ecosystems. In the future, Marion looks forward to learning more about the environmental issues and policies that affect marine environments. 1. Take as many classes as possible to learn the content and skills pertaining to marine science. 2. Explore different opportunities within marine science to broaden your view of marine science. 3. Contact and volunteer with people or organizations that share your same interests. Kate Doyle is a student at the University of Georgia in Athens, GA. She is working towards her master’s degree in Marine Science. Specifically, she is studying hydroacoustics with Dr. Daniela Di Iorio. Together, they examine Gray’s Reef National Marine Sanctuary acoustically with a device called an echosounder over a 24-hour period. Along with video footage collected from a remotely operated vehicle (ROV) equipped with a camera, Daniela and Kate hope to get a glimpse of both the duel cycle and the spatial distribution of the inhabitants of Gray’s Reef. In other words, they address how the fish at Gray’s Reef move in the water column throughout a day and where are all of the fish located within the area of the reef. Ms. Doyle grew up going to the New Jersey shore every weekend during the summers, an experience that fostered her current love of the ocean. However, it wasn’t until she was about 12 years old, that Kate knew marine science was the life for her. Kate remembers watching a Discovery Channel special on blue whales. "I was fascinated by the whole show. I remember frantically scrambling for a pen and paper as the program ended so I could write down the names of the scientists and colleges involved from the credits," Kate recalls. Throughout high school she absorbed as much as she could about cetaceans and the ocean. In college, at the University of Tampa (Tampa, FL) Kate majored in Marine Science and Biology and also earned a minor in Chemistry. The program enabled her to get some great hands-on experience in the Marine Science field and also work year-round due to the mild weather (a huge plus). Her summers during college were spent in New Jersey working as a naturalist on a whale watching/sightseeing boat. Currently, Kate has a typical graduate student schedule. She began her program at UGA in the fall of 2003. She is now completing the necessary course work for her degree and working as a teaching assistant for the labs in UGA's introductory marine science classes. She hopes to be finished with classes at the end of the Fall 2004 semester at which time Kate will be able to focus on her research full time. Until then, classes, teaching, homework, and research, take up most of her time. Once she earns her masters degree, she is done with school. Ideally, she’d love to find a job that allows her to remain very hands-on and that offers her regular opportunities to work in the field. She sees the National Oceanic and Atmospheric Administration (NOAA) as an organization that holds a ton of such opportunity for her and would love to work for them one day. What Kate enjoys most about the marine sciences is the number of different disciplines that are included under the marine science umbrella. "Biology, Chemistry, Physics" it’s all applicable to the ocean. It’s awesome", Kate exclaims. The more she learns about the sea the more she wants to know. Kate has found this cruise on the NOAA ship Nancy Foster particularly rewarding due to all of the scientists from different backgrounds that have come together to make this trip and conduct research out on Gray’s Reef. Kate appreciates all of the professionals in the marine science fields that encouraged her to continue following her passion in marine science. While students will find people who are supporting, she warns students that there are people within the field who will discourage the these budding marine scientists from following their dreams. Kate advises, "Take heart and do not get discouraged. If you are dedicated, you will succeed. And if you love what you do, then that is all the reward you need." Joining our talented group of scientists is Assistant Professor, Dr. Di Iorio from the Department of Marine Science at the University of Georgia. Her main research interest in Gray’s Reef is using acoustic echosounders to measure the pelagic biomass and its relation to bottom habitat. Daniela is a native of British Columbia and attended the University of Victoria for her undergraduate degree, B.S. in Honors Physics, as well as her doctorate degree in Physics. Dr. Di Iorio's high school physics teacher first inspired her to pursue physics as a career. In fact, she recalls wanting to become a physics teacher, like her mentor. But life would take Daniela down a different path. She remembers first hearing her calling to be a marine scientist when she was working as an intern during her undergraduate program. The University of Victoria offers a cooperative program where students alternate between coursework and internships every four months; this is where Daniela was first exposed to acoustics research. This research interest is a perfect synthesis of her interests in physics and marine studies. While being a wife and a mother of two sons, Daniela juggles a variety of responsibilities at the University of Georgia. She teaches both graduate and undergraduate core oceanography classes, as well as other graduate physical oceanography classes during the academic year. Dr. Di Iorio enjoys teaching most of all; it forces her to stay current with advancements in oceanography, as well as encourage scientists (especially females) to pursue physical oceanography. In addition to teaching, Daniela oversees three graduate students (one, Kate Doyle is joining her on this cruise) and provides them with advice and direction on new ways to collect and process data for their theses research. Dr. Di Iorio's personal research interest involves using acoustic methods to measure turbulence, heat fluctuation and flow in ocean environments including a hydrothermal vent in the Juan de Fuca Ridge. To fund these research projects, Daniela is constantly writing papers and drafting proposals, which the latter is her least favorite part of the job. Daniela loves her position at the University of Georgia and hopes she has the opportunity to enjoy many more years as faculty within the Marine Science department. Dr. Di Iorio is also involved with the public school system in her community. She serves as a tutor to the Ocean Science Bowl team at the Oconee High School in Athens, Georgia. She assists the teacher, as well as the students in the teaching and learning of the physical and chemical aspects of oceanography. She is pleased to report that this team won the regional Ocean Science Bowl this year and went on to compete in the National Ocean Science Bowl competition in Charleston, S.C.
Find work experience at the undergraduate level, if not before. You can do this by putting your resume together and send it out to different research scientists. Many scientists have funding for student researchers and are waiting for students to contact them. Make the first move, don’t wait. Identifying your career interests early will help focus your academic experience. Bringing nearly twenty-five years of fisheries experience to the Nancy Foster’s science crew, Mark Grace, a Research Fisheries Biologist is a valuable resource to this research operation in Gray’s Reef. Mr. Grace works with the National Marine Fisheries Service, a branch of the National Oceanic and Atmospheric Administration, in Pascagoula, Mississippi. Mark is no stranger to fisheries surveys, as he has conducted extensive work in the Atlantic, Gulf of Mexico, as well as the Caribbean. His interest in marine science began when he was a small boy growing up in Louisiana and Mississippi. He was constantly surrounded by water, whether a swamp or the open ocean. Mark describes himself as a "naturalist at heart" and owes his love for the outdoors to his father. As a high school student, Mark obtained a job as a laboratory technician with the Gulf Coast Research Laboratory, studying the effects of crude oil on coastal sea life. He remembers thinking that his chances of getting hired were pretty slim seeing that he was not the best student, but his attitude and perseverance paid off. After high school, Mr. Grace went on to get a bachelors degree in Biology at Southern Mississippi University and has added additional coursework along the way. Just by talking with Mark, you will soon learn that life experience has provided him with an exceptional understanding of marine ecology. After graduation, Mr. Grace worked as an observer of foreign fisheries in the Exclusive Economic Zone (200 miles offshore) and was quickly elevated to supervising the foreign fisheries program. 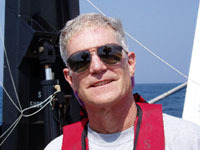 Within a few years of service, Mark served as Chief Scientist, as well as Project Leader for projects such as outer shelf exploratory research and longline fisheries surveys. Today, Mark functions as the shark team leader for Mississippi Laboratories with the National Marine Fisheries Service. Mr. Grace is also a scientific illustrator and has developed a series of sea life illustrations for scientific publications. During his research on reef habitats for his art, he began using video that provided a medium to view different phases of grouper. This experience segued into his work here in Gray’s Reef where by he is conducting fish surveys with digital camcorders to collect data on the fish habitat. Mark loves being a fisheries biologist and just by talking with him, there is no question that he is in the right profession. He enjoys most everything associated with his job, while having opportunities to travel and work with scientists, top his list. Mark admits that the external pressures that interfere scientific research frustrate him. He wishes that the motivation fueling scientific exploration were more pure, rather than being influenced by special interest groups. · Don’t be afraid to stick your neck out. If you find an opportunity that you would like to be involved with, go for it. · Take opportunities to travel and experience the world around you. · Ask questions that seem improbable. Don’t let fear of failure keep you from going after your dreams. 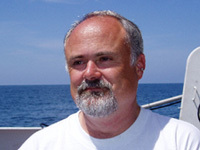 Glenn Taylor is the Technical Coordinator for the National Undersea Research Center at the University of North Carolina at Wilmington. He graduated with a B.S. degree in Engineering from Clarkson University in Potsdam, NY, and worked as an engineer with General Electric for three years -- and then something amazing happened. When Glenn was growing up, his family vacationed on the Jersey Shore each summer and through fishing he became interested in the fish and strange sea creatures he caught. His interest in the oceans increased during his teenage years, as he learned about scuba diving from Jacque Cousteau’s classic book, The Silent World. This inspired him to become certified as an open water diver later in life while working as an engineer with General Electric in Florida. As a result, of his diving experiences, he discovered his true passion and quit his job at GE. He became certified as an instructor with the National Association of Diving Instructors (NAUI) and pursued a career as a diving instructor in Jamaica, St. Croix (U.S. Virgin Islands), and the Bahamas. He later joined the operations team of the Aquarius Underwater Laboratory, a research habitat then located in St. Croix. The University of North Carolina at Wilmington took over the Aquarius Project in 1990 and Glenn moved to Wilmington NC to help refurbish and prepare the habitat for deployment off Key Largo, in the Florida Keys. Glenn claims he has "the best job in the world." As a mission coordinator with the National Undersea Research Center, his job is to help scientists perform research in the sea. Glenn gets to do scientific diving; he pilots a Remotely Operated Vehicle (ROV) on scientific expeditions, helps out on Aquarius missions, and as if that were not enough, he does "technical diving." This is a specialized form of diving that allows researchers to dive beyond the normal recreational dive limit of 130 feet using custom mixes of breathing gases such as nitrox (nitrogen and oxygen), heliox (helium and oxygen), and trimix (helium, nitrogen, and oxygen). When asked what he liked most about his job, Glenn immediately replied, "The people. I work with a variety of people: vessel crews, scientists, graduate students, and divers. We all love what we do so we put a lot of effort and creativity into our work. The sea is a challenging place to work. I learn new techniques and interesting things about the sea and its inhabitants every day." Another aspect of the job that he likes is the variety. Glenn has worked on research projects with biologists, geologists, archaeologists, and physicists all up and down the East Coast, the Florida Keys and Dry Tortugas, the Gulf of Mexico, California, and the Bering Sea. He has lived underwater in the Aquarius Undersea Laboratory as the habitat technician, and gone to over 2,200 feet deep in the Johnson-Sea-Link submersible, and dived to a depth of 240 feet on the wreck of the famous Civil War ironclad, USS Monitor. When asked if there were a "down-side" to his job, Glenn hesitated, and then said that he typically spent more than 100 days at sea each year. "Being away from my family is sometimes difficult, especially if I miss birthdays and anniversaries. I’m away so much that I often can’t participate in classes and special events. That’s the difficult part." Glenn said he has an understanding wife and daughter. As for the future, Glenn says he is working on a book about his diving adventures. "It won’t be done anytime soon," he said. "I’m too busy doing it to write about it." When asked if he had any advice for students who might be interested in this type of work, Glenn had this to say: "The tools we use in marine science -- the ROVs, survey equipment, undersea habitats, research vessels, submersibles, Autonomous Underwater Vehicles (AUVs), and even the diving are all becoming more and more complex. The skills I use every day involve an understanding of math, science, and computers. The more formal education you have, the better your job opportunities will be. But my number one piece of advice is to choose something you really enjoy doing." Unlike the other members of the science crew, Dave is a volunteer - a recreational diver with an interest in marine science. He's a member in several organizations including an Advanced Assessment Team member of Reef Environmental Education Foundation (REEF) in Key Largo FL, a Divemaster and Scientific Diver at the Florida Aquarium in Tampa FL, and an Animal Handler at Mote Marine Laboratory Dolphin and Whale Hospital in Sarasota FL. His formal educational background is business (a Bachelor's in Aeronautical Administration and an MBA). He spent his first 20 years after college in the Air Force serving as B-52 navigator/bombardier, headquarters staff officer, weapons test director, and finally as weapon safety analyst. Retiring from the military in '97, he moved to Florida and pursued his passion for diving and the ocean. He immediately sought out volunteering options that aligned with his desires. One organization that quickly caught his attention was REEF. As a member of REEF, he conducts fish population surveys during his recreational diving. REEF is a grass-roots non-profit organization made up of volunteer divers. Divers note on an underwater slate what fish species they see during their dive. After surfacing, the diver submits that data to REEF. REEF then enters that information into a central database. The data allows scientists and decision makers to monitor the fish population in the oceans around the US. Any recreational diver can become a member of REEF after some quick initial training. When a REEF volunteer achieves expert status, he can join the Advance Assessment Team and be used for special research efforts like the Nancy Foster. "I've been lucky to participate in some cutting edge research with REEF over the past couple of years." In addition to doing fish counts, Dave also dives at the Florida Aquarium. He started volunteering at the Aquarium soon after arriving in Florida. Through the years he's expanded his role there. Dave performs the dive show in the shark exhibit and in the coral reef exhibit. He helps maintain the exhibits and assists Aquarium's biologists in collecting animals from the waters of Florida. During that time, he became a Scientific Diver under the auspices of the American Association of Underwater Sciences (which the Florida Aquarium is a member). When not diving, he often works with veterinarians at the Dolphin and Whale Hospital at Mote Marine Laboratory. They rescue stranded dolphins/whales and try to rehabilitate them for return to the wild. "It's an amazing feeling to support a dolphin calf in your arms as you nurse it back to health." Some of the more unusual animals he's worked with are dwarf sperm whales, pygmy sperm whales, and a rare beaked whale. It's a very "hands-on" experience - helping to feed, medicate, and take data. "One great aspect of volunteering is that there are so many opportunities to do things that not only help but also provide a satisfying feeling of accomplishment." When asked what was the downside, he replied, "There's not enough time in a day to take advantage of all volunteering opportunities I'm interested in." Sometimes he finds it hard to balance it all, which is why he no longer volunteers at Lowry Park Zoo in Tampa taking care of injured manatees. What's on the horizon for Dave? More diving. "You never know what the next dive might bring and I'm eager to put on a tank and see what nature throws my way." Some of his memorable sights underwater include a trio of humpback whales gliding by in Hawaii, giant mantas doing summersaults in Yap, spending a whole dive side-by-side with a whale shark in the Gulf, eagle rays cruising by in the Keys, colorful lionfish displaying their venomous fins in Palau, and sea lion pups tugging at his fin tips in Mexico. What advice would he give to students? "Sometimes school work can be tough to do when you don't see its relevance to your future. But then you discover what intrigues you and you suddenly see how those classes enhance your pursuits. It's really true - the more you learn in class, the more doors open up to you down the line." I am student at the Graduate School at the College of Charleston in Charleston, S.C. working towards my master’s degree in teaching; I hope to teach middle school science one day. Science education is a path that I have been traveling down for many years. After receiving a bachelor’s degree in Environmental Geology in 1997, I worked for the Washington State Parks and Recreation Commission as Manager of the Dry Falls Interpretive Center in Coulee City, Washington. There, I had the opportunity to explore the rich geologic history of the western United States, as well train others in communicating science to the general public. Wanting to return closer to my family and friends, I served as Program Coordinator for the Lowcountry Hall of Science and Mathematics at the College of Charleston. I had the opportunity to work with teachers and scientists as I developed and managed programs designed for improving science teaching and learning. While working full time, I obtained my master’s degree in science and math education, which seemed like a natural fit with my professional experience. I left Charleston after graduation and headed for our nation’s capitol. In Alexandria, VA, I served as Curriculum Developer for the American Geological Institute and worked as part of a small writing team in the development of an Earth system science textbook for the middle grade levels. This experience provided me with many opportunities to enrich my science understanding, as well as research teaching strategies that work best in science classrooms. Being drawn back to Charleston, S.C. in 2003, I decided to return to school to pursue a teaching degree. So here I am back at the College of Charleston; I will finish my degree in December 2005. While hearing my call to teach, as well as seeking out opportunities to continue my own learning, the timing of this experience aboard the Nancy Foster could not have been more precise. I have always been excited to learn about our oceans from a geologic standpoint, but our living oceans have not intrigued me nearly as much… that is, until now. Having the opportunity to explore Gray’s Reef, along side of scientists and other graduate students, is a learning experience that few classrooms can offer. The excitement associated with pulling fish traps aboard, watching the ROV video footage, or listening to the scientists recall their experiences is something that engages the learner as well as the veteran scientist, alike. Exploring this reef system has greatly influenced my thinking about these dynamic environments and will impact my teaching, as a result. It will provide a context for which I can hook students in science. Photos (like the one of the Shark Sucker), coupled with stories from the ship, will spark students’ interest in science, as well as inspire them to begin thinking about career options. I encourage other teachers to participate in this kind of learning experience where one can learn directly from scientists and technicians who possess a wealth of experiences and understanding that few textbooks convey. This was, truly, an opportunity of a lifetime!